So why not face that challenge with an official partner, who equally embodies American tradition—while aiming for a high performance and reliability? With General Tire, the Euro NASCAR has entered a six-year cooperation to meet those requirements. Admittedly, six years for a sponsoring cooperation is a most unusual timespan in motorsports. But it’s most telling in terms of the trust Euro NASCAR places in General Tire. In return, the brand has developed a race tire that promises to meet the high expectations of the 30 Euro NASCAR teams. After all: Anywhere is possible. From the Euro NASCAR race track to the winding roads of Europe. All alongside the well-known NASCAR racing conditions, such as driving distances and time, even vehicle weight and speed must be considered. The General Tire branded car (see image) is a fine example of how spectacular a Euro NASCAR car can look in race trim—though General Tire does not intend to put it on the start grid just yet. It proudly symbolizes the cooperation between General Tire and NASCAR Whelen Euro Series and will be seen regularly at exhibitions and promotional events such as the “Autosport International”. Of course, cars cannot race without an approved number, and the General Tire car was assigned the number 61 as a conscious choice; with clever styling, the number 61 is visually similar to the brand initials “GT”. 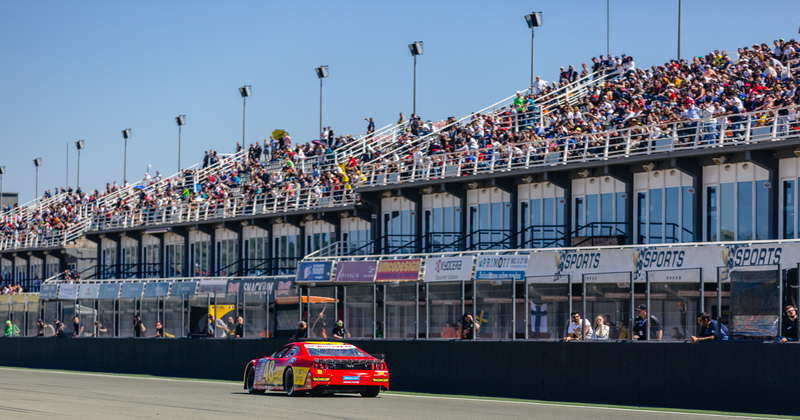 The NASCAR Whelen Euro Series capture a European audience with these emotions and thrills: In 7 countries and race weekends, throughout 26 races. The challenge though, are the European tracks. They are a mix of various tracks famous from other motorsport events and even include a classic NASCAR oval. Competing in Europe demands a whole different set of abilities from driver and machine alike. In Valencia, Euro NASCAR drivers take the course counter-clockwise on a length of 4.005 km, facing 9 left and 5 right turns along with a straight run that is the longest straightway in the Euro NASCAR season. Particularly the curve after a chicane, right before the finish line, takes some skill. All-in-all, a dynamic and exciting track. The Italian circuit opened in 2008 near Lake Garda and is one of the latest venues of the NASCAR Europe series. It’s over 12 meters wide and 2,519 asphalted kilometers, 8 right and 5 left bends are taken clockwise. Drivers consider the curves to be easily visible and fluid. This route has a long tradition going back to the 1940s and is about 30 km southeast of London. It may look inconspicuous at first—but it packs its own punch: The NASCAR track in the UK is 1,929 km long and has 4 right bends and 2 left bends clockwise considered demanding by the NASCAR drivers, as they can be underestimated due to the strong variation in cornering speeds. With a combination of 12 right-hand and 9 left-hand bends, the 4.212 km long course is curvy and challenging. It is driven clockwise and perfect for NASCAR races: The comparatively straight and thus fast first section of 792 m length is followed by a real roller coaster ride, which requires solid driving skills. The track also known as Circuit de Peel is considered to be the fastest oval circuit in Europe. The only 800 m long circuit with its 4 high-banked turns corresponds to a classic ½ mile oval NASCAR drivers are familiar with. It is typically driven counterclockwise and offers a thrilling show made of high speeds and side-by-side action in classic NASCAR fashion. The traditional and legendary track guarantees a dynamic race on 3,692 km. On the fast sections with exciting overtaking opportunities, every chance has to be exploited, and that plays a large part in making Hockenheim one of the fastest tracks in the calendar. For the NASCAR Whelen Euro Series, Hockenheimring plays host to the semifinal for the second time. This race plays a major role in the battle for the title—while it’s not possible to win the title by placing first in the semifinals, history has already proven that it’s possible to lose the chance for the title. 6 right and 4 left turns—including 3 chicanes—must be conquered in Zolder, southeast of Antwerp. Like many other European courses, it looks back on a long and eventful history including Formula 1 races in the 70s and 80s. The course on 4.011 km asphalt is driven clockwise and is considered demanding with its hill jumps and blind bends. While the first section is smooth to drive, the second section is tough and calls for calculated braking maneuvers by the talented NASCAR drivers. The National Association for Stock Car Auto Racing—in short NASCAR—is a company that sanctions and operates stock car races on a global scale. Its beginnings and roots are in Daytona Beach, Florida of the late 40s, the birthplace of American stock car races and home to the Daytona 500. The strong American roots characterize all NASCAR races, now including the sponsoring of the Whelen Euro Series by General Tire. It was in Daytona where the NASCAR has played a great part in the growth of stock car races as they are today. It was actually the NASCAR founder, William France Senior, who thought and realized the Daytona International Speedway. All competing NASCAR teams have the same initial conditions: The same NWES engine, chassis, gearbox, weight, safety features—and tyres, in this case General Tire up to 2024. Three body kits—all equivalent in performance—are available: Chevrolet Camaro, Ford Mustang, Toyota Camry. The NASCAR Whelen Euro Series started out as race car series organized by French Team FJ in 2009. Back then, it was named Racecar Series and the tracks were mainly located in France. Towards the end of 2010, the Fédération Internationale de l’Automobile (FIA) announced the Racecar Euro-Series as officially recognized international race series. As a result, the number of venues in Europe increased in 2011. Euro NASCAR brings the characteristic spirt and the exciting competition typical of NASCAR to the Old Continent, mixing it with a unique European flavor. A new three-way shock absorber has been developed by the organizer Team FJ and must be used by all teams. All cars have to go through an enhanced technical inspection process system for every race. The inspection system has been improved with support from the NASCAR R&D Center.